Tobii calls the REX a gaze interaction peripheral: it attaches to a PC’s display. The Swedish company said it is the first such device for the consumer market. 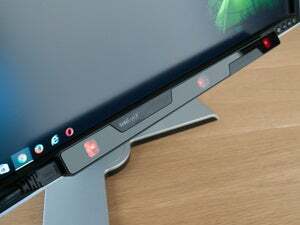 Tobii’s REX gaze interaction periphal adds eye control to PC displays. “This is a natural step for us. We have been working on products for niche markets for many years, but the ultimate goal has always been to develop our technology so it can be added to any computer, and a peripheral is the easiest way to do that,” Sara Hyléen, marketing director at Tobii, said. At next week’s International CES show in Las Vegas, Tobii will demonstrate some of the core features of its technology, including the ability to select, scroll, zoom and navigate using eye movements. “What the eye is superior at is pointing, because that is something we do naturally. You look for what you want to click on or zoom in on, and then you have to move the mouse or if you are using a touchscreen your hand. That middle step you can skip when using eye-tracking,” Hyléen said. To keep track of what the user is looking at, Tobii uses two specially built optical sensors. Developers will be the first to get their hands on the REX: A special developer edition of the peripheral will go on sale next week, according to Hyléen. “We want to build a larger community of developers that can create applications with eye control integrated. So we then can offer consumers a richer product during the second half of the year,” she said. The Tobii REX Developer Edition costs $995, and in addition to the peripheral, the package also includes an SDK (software development kit) and other support materials needed to help developers get started in an area most aren’t familiar with. Users of the package have to think carefully about how they implement Tobii’s technology, because there are some pitfalls, according to Hyléen. Often developers think they need to implement eye-control for everything. But for people that have the ability to use their eyes along with traditional controls a combination often ends up being the most effective interface. At first, the company will manufacture a limited run of 5,000 Tobii REX units for consumers. Users that want to get access to the product before everyone else can sign up on Tobii’s website. “We feel its a good idea to start small, and prove the technology works and that there is a viable market for it,” Hyléen said. For now, the consumer unit only works with Windows 8. She wouldn’t say what it will cost. Tobii expects its technology will be integrated in laptops and displays in 2014 or 2015, with tablets to follow. Tobii attended CES for the first time last year, and is returning to the show in Las Vegas next week. Like many smaller vendors that take part it hopes to make new connections in both the hardware and software field. “You get to meet everyone at CES, which is a lot of fun. … It is also a chance to take the pulse of our own technology,” Hyléen said. CES takes place between Jan. 8 and Jan. 11.